Work has been taking up pretty much all of my time since arriving but we were able to go away to the Blue Mountains last weekend. We rented a car for 24 hours without having really known what we would use it for, other than 'exploring' a little. So, we headed towards Hertz, stopping briefly at a park in the centre of town for a coffee and piece of carrot cake. As we sat down to eat, the hugest bird flew in (pictured on the left). Ungainly does not even cover it. Clearly this 'fella had not had much practise before. Feathers were going everywhere and his legs making an almost peddling motion. Highly musing. 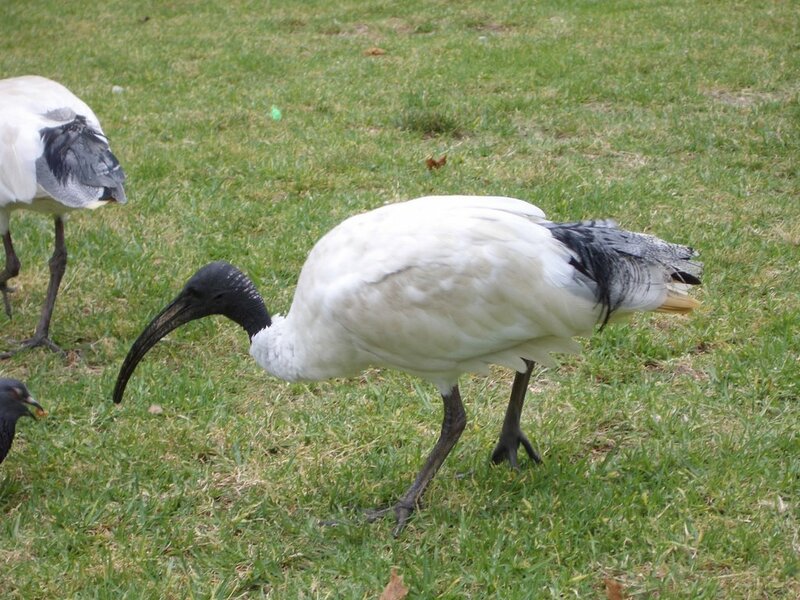 Anyway, it was the bird pictured bove. I think he was only interested in a bt of my cake but soon got bored. After collecting the car, we decided to head to a place called Palm Beach. This is somewhere that Justine had said she wanted to visit before we left so it seemed an appropriate time. The main reason she waned to go was because one of her favourite TV programs is filmed there, Home and Away. There wasnt actually that much to see there but it is a very nice place. We returned home at about 8pm on the Saturday night and decide we wold head up to the Blue Mountains that night as it was a 90 minute drive, thus saving time in the morning. Despite the hotel looking nice, it was a bit of a 'hole' to be honest. Lovely on the outside but in serious need of renovation internally. A typical stately home type affair. The following day we toured around the Blue Mountains, the highlight being a place called Scenic World. As the name suggests, it provides some awesome views and also a thrill or two along the way by way of the worlds steepest railway. I say that was the highlight but there was one further 'highlight' that day. On the way home we stopped off at a National Park called Glenbrook. It is in the middle of nowhere and you have to drive through a few miles of tracks, through a 'ford' (water covering the road) and up and down some incredibly steep hills. It is worth the trip because eventually you come to a clearing that is a picnic area. 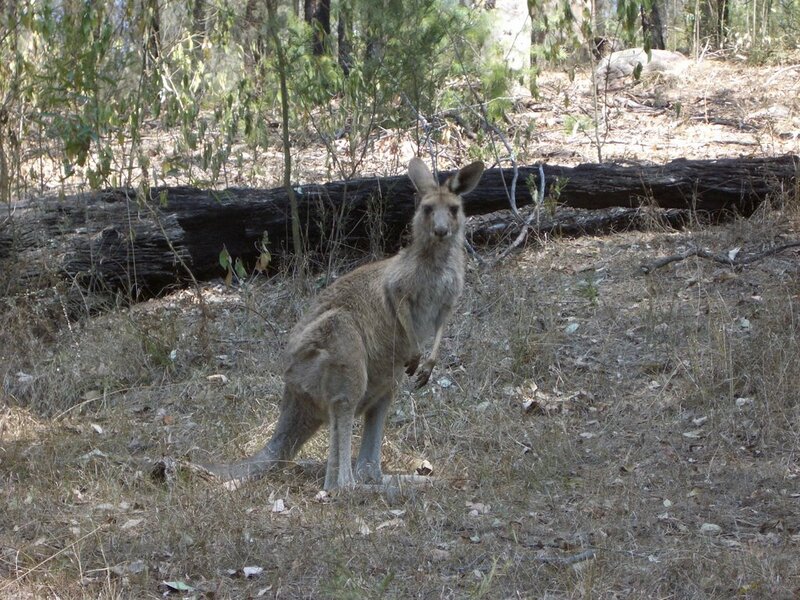 In the late afternoon you get Kangaroos come out in to the area which is quite a sight. The one on the photo above was one of about half a dozen that we saw. They seemed quite comfortable with us getting close to them, as long as we still kept a bit of distance. It was a great weekend and we are hoping we my be able to get back up there before we go. Last night was our Staff Christmas pary which we had in quite a funky area of Sydney called Darling Harbour. I only had two drinks all night as I have been so exhausted so no hangovers today I am pleased to report. I will post a few photos from our trip so far over the coming days.